Updated to add: These were almost no-sew to put together. I glued the smaller ones and some of the more delicate ribbons on the larger ones. 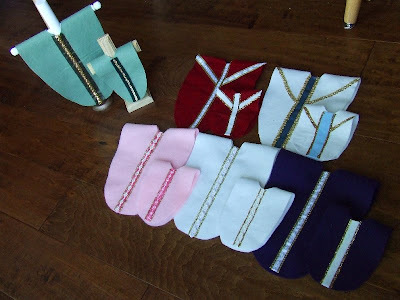 The trim on the larger ones was either glued or tacked down with simple hand sewing. And since felt does not need to be hemmed, you can just cut it and go! My idea is that every morning, the big kids will take turns looking up the liturgical colors of the day and place the appropriate chasuble on Fr. Dowling while BigBoy's job is to find the matching one for Fr. R. I think it's a little Montessori-ish and he thinks it's his big boy chore for the day! P.S. I hope to make more parts of the vestments and use this Vessels and Vestments card game along with other resources to help us all learn about them. I'll keep you posted. I am inspired, I don't have any sewing skills though. Thanks for that link Megan. I hope to get a chance to peruse it thoroughly later. Let me just say that the only sewing required was for the larger chasubles and I only did some simple hand sewing to tack the ribbon on. It doesn't look pretty from the back side! The smaller ones were all glued on and the chasubles themselves were cut from felt which doesn't require hemming. What lovely vestments you have made! Do you have a copy of The Priest Game? Ooooh. I hadn't heard of that game. I would love to know what you think of it once you get a chance to play it. I was hoping to leave a comment yesterday , but life got in the way. That is so impressive. I am still decorating mine and had thought of using felt along with other ideas but I think the simpler ones would be better, ie. they might actually get done quickly. What are you actually thinking of making vestment wise? I actually was thinking an Alb myself, last week to put under the chasuble but haven't come upwith an easy version to get on and off. Maybe slit up th back with velcro? I don't know yet. Thank you for sharing your ideas, they are always an inspirarion.